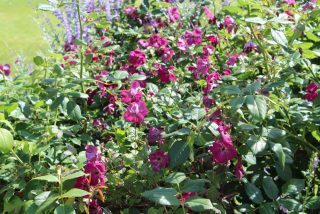 As mentioned in February’s column, we devote a lot of time and effort to managing roses and clematis so that they flower at the same height and mingle. In June, roses take centre stage with their first abundant flush. 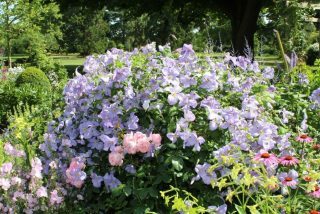 In July, however, repeat-flowering roses take a short break before producing the next set of flowers in August. 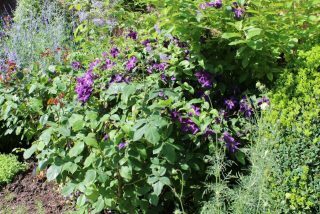 This is when their clematis partners come into their own: scrambling through the rose foliage, they lend their flowers to the rose, transforming a green shrub into a flowering one. This is a lovely effect well worth the springtime graft! We have many such couples throughout the South Garden and it is very exciting to see the changing effect.